Pollen Party slot is Microgaming's nature-inspired slot about bees and parties. The theme is based on flowers, insects (namely bees) and pollen like their other game Pollen Nation and similar juvenile cartoon-style graphics along with a jaunty musical soundtrack, is there anything new here to create some sort of buzz? In a simple answer to the above question is No. Microgaming have digressed from their usual format and used the 720-way one more commonly seen with IGT games such as Siberian Storm, Sumatran Storm and Ghostbusters Triple Slime etc. As you may be aware this takes place on reels with a pattern of 3-4-5-4-3 rows and gives the opportunity to have stacked symbols and multiple features. Here we have honeycomb shaped icons and various insect characters along with sweet items like honeycomb, honey jars and cakes. 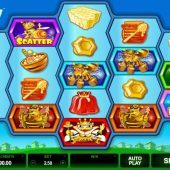 Aside from the game's 2 scatter symbols which both pay 100x bet for 5-of-a-kind, the best is the Wild (the game's logo) which appears in small stacks on the centre 3 reels and singly on the outside ones - this pays 10x stake along with a different Wild and expanding Flower Wild which both appear in the free games. The various insects pay from 8 down to 3x stake for 5 down to lowest sweet food icon at 0.8x bet. Other than the Wilds, all symbols can on appear once on each reel - no stacks here! If three or more of a rather sozzled-looking 'Bonus' insect of indeterminate species (the nectar been fermenting?) land anywhere in view then you go to a screen of honeycomb which will have around 20 locations highlighted. Pick them as you please to get cash awards of 1 to 20x stake avoiding the 'Pop' symbol which stops the round and collects any accrued wins. Picking the Happy bee awards an extra life and it seems the game only conceals 2 of the Pop positions thus the Bee is indicative usually of a decent bonus, as you can get a respectable return in this round. 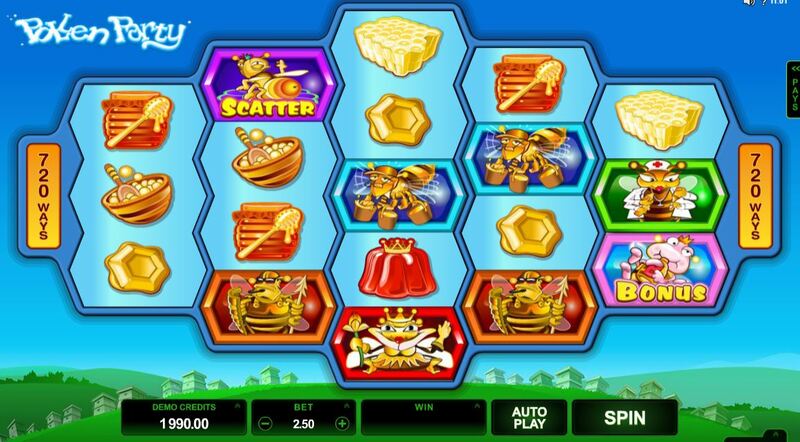 Three or more equally drunk-looking 'Scatter' yellow insects award 12 free spins. These cannot be retriggered and the stacked Wilds disappear too. Not a sweet start but we do have an enhancement. There are single Wilds and in addition there is a special expanding flower Wild on reel 3, similar to the Loki Wild in Thunderstruck 2 or Wild Vine in Immortal Romance - in other words it will zap other reel positions and turn them Wild before calculating any wins if it appears. As with those games, it's usually ineffective and disappointing.